U.S. Attorney General Eric Holder said Wednesday that the Justice Department will respond "appropriately" to a federal appellate judge in Texas who demanded a letter recognizing federal courts' authority to strike down laws passed by Congress. CHICAGO (AP) — U.S. Attorney General Eric Holder said Wednesday that the Justice Department will respond “appropriately” to a federal appellate judge in Texas who demanded a letter recognizing federal courts’ authority to strike down laws passed by Congress. 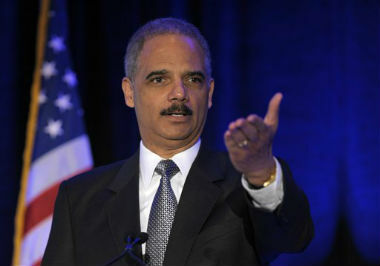 Holder spoke a day after 5th U.S. Circuit Court of Appeals Judge Jerry Smith questioned President Barack Obama’s remarks this week about an “unelected” court possibly striking down the president’s health care overhaul. Smith, during oral arguments in a separate challenge to the health law, asked the Justice Department for a three-page, single-spaced letter affirming the federal court’s authority. White House press secretary Jay Carney told reporters in Washington that Obama does not regret using that word, and he insisted Obama was not trying to bully the justices by weighing in before the case is decided. A reversal would not be unprecedented, even under the very narrow terms Obama and his spokesman later attached to his comments, but it would be very unusual. Obama had sought to clarify his remarks under questioning at The Associated Press annual meeting on Tuesday. There, Obama said he was referring only to a specific class of constitutional law, and to the pattern of judicial deference to Congress exemplified by the upholding of New Deal legislation in the 1930s. Carney also repeated Holder’s assurance that the Justice Department would comply with the Texas judge’s demand for a letter of explanation. Smith on Tuesday had seemed to take offense to comments Obama made Monday that he didn’t believe the Supreme Court would take the “unprecedented” step of overturning a law passed by a strong majority of Congress. He said he wanted reassurance that Holder and the Justice Department recognized judicial authority. “The letter needs to be at least three pages, single spaced, no less and it needs to be specific. It needs to make specific reference to the president’s statements,” Smith said during a case brought in part by a spine and joint hospital in East Texas that is challenging the constitutionality of a portion of the health care law. Smith’s office in Houston said Wednesday the judge would not be commenting on the issue because the case before his court still is pending. Smith, a native Texan, was nominated to the appeals court by President Ronald Reagan and confirmed by the Senate in 1987. Speaking at the same Chicago press conference during a meeting on health care fraud prevention, Health and Human Services Secretary Kathleen Sebelius said her department is continuing to implement the health care law without contingency plans for a Supreme Court ruling against it. Associated Press writers Anne Gearan in Washington and Juan Lozano in Houston contributed to this report.